Korean food manufacturer renowned for “Fire Noodle,” Samyang Food released another spicy instant noodle targeting the international market. 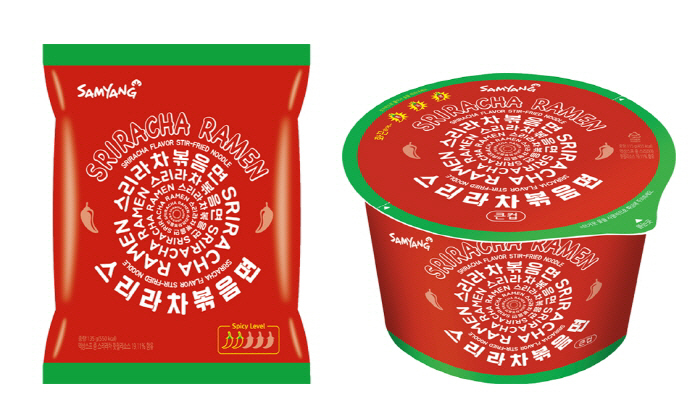 On April 6, Samyang Food unveiled new product “Sriracha Ramen.” The product uses globally popular Asian hot sauce Sriracha as the sauce’s base. Sriracha Ramen comes in three variations including packaged noodle, cup noodle, and snack. Like Buldak Bokkeum Myeon, which is popularly known as “Fire Noodle,” the new product is a stir-fried type cooked without broth. Reactions to the product in its first week of the release are positive. Especially, reviews say its modified spiciness compared to Fire Noodle makes the product more approachable. According to the spicy level Samyang Food suggests Sriracha Ramen in less spicy than Cheese Fire Noodle, which is the least spicy flavor of the product. As the popularity of Southeast Asian cuisine in the country has vastly increased lately, market insiders expect Sriracha Ramen to be settled as the successor of Fire Noodle.